The Battle of Midway is one of the most significant historical events for the Cryptologic Warfare community and the Navy as a whole. As such, beginning this Friday, May 6, 2016, Station HYPO will be kicking off a 5-week series entitled "Path to Midway." 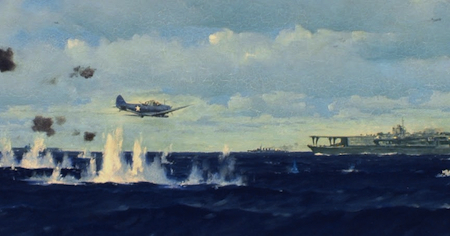 The series will consist of one post per week and will cover (1) the months prior to America's entry into the war as seen from within the walls of Station HYPO, (2) the December 7, 1941 Japanese attack on U.S. forces in Pearl Harbor, (3) Station HYPO's subsequent tracking of the Imperial Japanese Navy, (4) the Battle of the Coral Sea, and (5) the Battle of Midway. Tune in to remember and celebrate the remarkable efforts of CDR Joe Rochefort and his exceptional team of cryptologists in one of America's most crucial battles. Visit StationHypo.com for more info.